Hit the birding trail for the fourth day in a row, Tuesday, October 20th, by checking out Babcock-Webb WMA in Charlotte County. The location is famous for the big three rareities for south Florida of the Red-Cockaded Woodpecker, Bachman's Sparrow and Brownheaded Nuthatch and on the this trip I miss on all three. On Monday October 19th I still had the bug to cash-in on the big cold front fall-out in the Miami area that stung us on Sunday's hawk watch on Sanibel Island. I had the day off and arrangements had been made to free-up my time, so I ventured over to the east coast. To reach my first stop by sunrise, I had to leave home at 4am. This stop was at what some birders call Lucky Hammock and The Annex on Aerojet Road. This just outside of the eastern entrance to Everglades National Park. The attached posting on the TAS message board, noted an exciting list of birding opportunities like White-Tail Kites, Short-Tail Hawks and Western, Eastern and Gray Kingbirds plus a Philadelphia Vireo. Arrived just before sun-up and drove the length of the road looking for any nighthawks or chucks-poor-widows. None found. But a Norther Harrier quickly arrived on sight and a roosting White-tailed Kite was noticed sitting atop a bush in the field. The kite soon took off in the early morning. Short-tailed Hawks began to show up and several, both light and dark were active in the area. It was still windy like Sunday which tends to keep many birds buried in the shrubbery, but the hammock area yielded some good birds. They included a female Ruby-Throated Hummingbird, Prairie Warbler, Palm Warbler, Northern Parula, Magnolia Warbler, several American Redstarts, a female Painted Bunting. A couple of pairs of Sandhill Cranes came in to the nearby fields. The Annex area was not nearly as birdy because of the winds. Lots of Gray Catbirds were vocalizing but skulking in the brush. A a very late Gray Kingbird fought the winds in its effort to sit on the power lines. Never did find any eastern Kingbirds, but I did run into Larry Manfredi, who showed me were a Western Kingbird was sitting. The Gray and Western would be keeping each other company. Larry Manfredi is a noted local birder and guide. His web site is very valuable in the search for south Florida and Caribbean specialties. Larry spend a half hour with me, sharing information on the background to this location and how best to look for certain specialities. I would love to book a trip with him some day. Enter Everglades national Park about 11:00am and spent the next four and half hours looking for birding hot-spots. They were not to be found here today. Took a stab at the Western Spindalis in Long Pine campgrounds, but not much of anything was found there. Not much was found anywhere. Ventured all the way to Flamingo were a few shorebirds and several Ospreys were present. Had a bald eagle soaring above Eco Pond. Noted several flocks of Wood Storks moving back into south Florida. Today there was a large American Crocodile basking on the shore across from the marina at Flamingo. Left the park for my final stop before heading the three hour drive home. Headed over to the Homestead-Cutler Ridge area to a site known as Cutler Wetlands, which is a surface water management sight. While sitting at a red light at US 1 in Homestead I was able to locate a pair of Common Mynas among the hundreds or so crows, grackles and starlings hanging out at the intersection, by the white spots under there wings as they flew from one resting spot to another. The extreme variety of birdlife found at Cutler Wetlands makes it a must stop location. Past sightings have included sacred ibis, flamingo and yellow-headed blackbirds. Today we had Long-Billed Dowitchers, Lesser Yellowlegs, Spoonbills and Blue-Winged Teal. 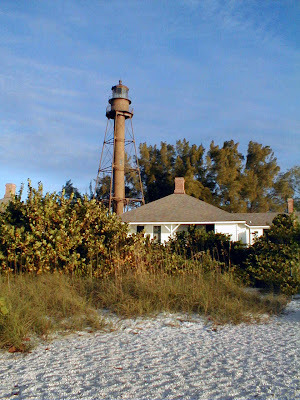 Had been looking forward to the Audubon of Southwest Florida's Sanibel Lighthouse Hawk Watch for some time. Because of work I missed last year's event, but showed up the very next day to take a try on my own. Luckily I ran into Vince McGrath who had lead the prior day's hawk watch. This one-on-one was a great learning experience for me. We had well over 100 American Kestrels, a few Merlins, Peregrins and Ospreys. had a number of Sharp-Shinned Hawks and many Swallows. I think we even had a Bald Eagle. So this year, we had a very nice cold front arriving right on time for this years scheduled hawk watch on Sunday October 18th, 8am - 10am. My debate was to show-up for the scheduled event or come on my own the following like last year due to the fact that I was getting off of work at 7:00am Sunday morning. Because of the potential bird fallout from the cold front was such a great opportunity I elected to struggle with my constant bane of sleep derivation and headed over to Sanibel Island on Sunday straight from work. The weather was very windy and chilly by Florida standards. But those strong winds had actually blown the birds away from southwestern Florida. Turns out Miami and Key West had outstanding birding that Sunday. So our birding was very slow. Very few song birds were on hand. Our first hwak arrived at 9:45am - a Sharp-Shined Hawk. By the time I left at 11am we had about 16 American Kestels, a dozen Sharp-Shinned Hawks, a couple of Broad-Winged Hawks and a few Ospreys were present. Also had about 6 Merlins with one individual we found very entertaining as it was aggressivelly interacting with another Merlin and the other hawks present. Prehaps those birders still on hand managed an outstanding sighting like a mississippi kite or something like that. You just never now when something exciting might show up. But not for me. It was time for some sleep for me. Joined up with a Duval Audubon Society bird tour Saturday, October 3rd on Fort George Island, lead by National Park Service Ranger, Roger Clark. Excellent event. Started at dawn riverside at Kingley Plantation Preserve, over to Ribault Club, then to Huguenot Memorial Park ending at various roadside sites near to New Berlin Road. Had four lifers including Carolina Chickadee, Yellow-Billed Cuckoo, Great Black-Backed Gull and Clapper Rail (only heard several over the course of the day actually). I recorded 84 hits, but the group recorded 105 hits for the day. Ironically our final, but unrecordable birds were three mute swans found on an isolated lake in a half-built out subdivision. Kingsley Plantation and Ribault Club are a part of Timucuan Ecological and Historic Preserve which is operated by the National Park Service. On the day we visited the local PBS station ran a documentary they created about this local National Park Service facility to compliment the the rollout of the Ken Burns "National Parks" documentary that PBS is now featuring. Our tour leader for the day was one of the national Park personal interviewed for the program. We stayed for a couple of hours and the best sighting was a Hermit Thrush.